This heavily embroidered textile is made of panels cut from cotton flour sacks and rejoined with bands of handmade lace. 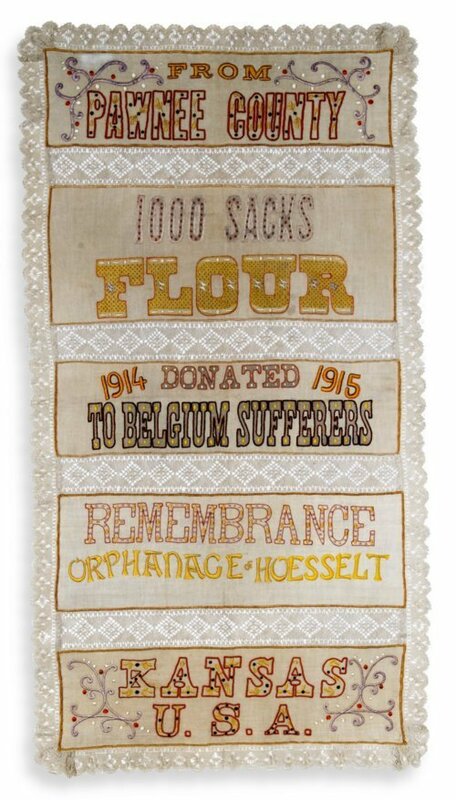 The text is embroidered in the colors of the Belgian flag, and indicates Pawnee County, Kansas, contributed 1,000 sacks of flour to "Belgium Sufferers" in 1914-15. The bag apparently was embellished by needle workers at the orphanage in Hoesselt, Belgium. This sack originally contained Kansas flour sent overseas during World War I for relief efforts organized by the Commission for Relief in Belgium. Some of the sacks were embroidered by Belgian women and returned to the United States as an expression of gratitude. The Kansas Belgian Relief Fund received this sack and placed it on display in a downtown Topeka store before donating it to the Kansas Historical Society.